Sometimes, Big Blue Serter wins. A little voice in my head kept telling me Put down the camera and stop the bleeding! I should have listened to that voice. On the second try, the sensor went in perfectly smooth, like butter (like buttah, as they say in New York). Three seconds later, it came out – equally as smooth. Shannon’s Diabetes Blunders must be contagious, because I apparently forgot to pull off the tape to expose the adhesive. On the third try, I went with an old reliable site, just below the elastic waistband of my Joe Boxers. You won’t get a photo of that, but the boxers have images of skates, sticks, pucks, goalie masks on them. They’re really cool, and a little blood wouldn’t exactly be out of place. (You didn’t need to know that). But it’s a good thing I keep these sensors in for more than three days (you shouldn’t. It’s against the law, remember?). Because now I’ve got extras to get me through. Whether with test strips, sensors, or anything else, it’s always good to have reserves, just in case. Posted on July 17, 2012, in Continuous Glucose Monitor (CGM), Diabetes and tagged mistake. Bookmark the permalink. 7 Comments. Ick – yup, I almost always (note the almost) have kleenex nearby when changing a set. But I hardly ever have my camera. Glad the third try was the charm! Ever since cell phones started incorporating cameras, I’ve got mine pretty much everywhere I go. Makes you wonder when they’ll start integrating them with insulin pumps. 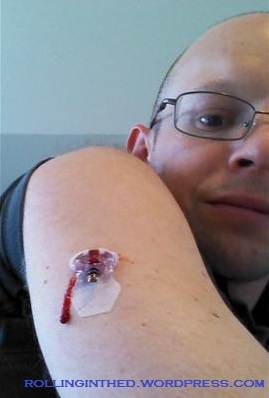 If I had a camera-pump, and the tubing doubled as a fiber-optic line, I could see exactly what’s going on subcutaneously with the cannula, pooling insulin, or whatever else happens beneath the skin. Third times a charm, huh? Ugh, three sticks with those sensors sure isn’t fun though. Ouch, that’s an impressive bleeder. Thankfully I rarely have anything like that with my pump, I use a Cleo set.